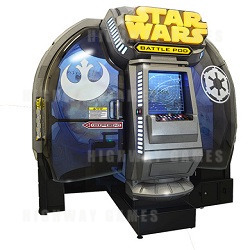 The Star Wars Battle Pod Arcade Machine is a video simulator game based off one of the most beloved franchises to hit movie screens - Star Wars. The machine offers players a unique experience that will have fans of the franchise foaming at them mouth. Inside the large, enclosed cabinet there is a 180 degree, high definition Dome Screen monitor, a single simulation seat, and flight controls (i.e. throttle, joystick, etc.) - this game looks and feels like a real cockpit. These features give a deeply immersive experience to players as they explore the various strange yet familiar worlds of the Star Wars universe. Players will not only be able to enjoy watching the battles as they race and shoot down enemies from the Empire on this huge screen with a complete left to right field-of-view, but they will also be able to feel the battle too through the force feddback in the controls and hear it thundering around them from the subwoofer inside the cockpit seat. The Star Wars arcade machine plays out as a set of disconnected stages. Players choose which stage they want to play through after dropping in their money. Once a stage is selected, the game opens up with a short in-game tutorial which incorporates the beginning of the roughly four-minute-long game session. The object of the game is to get the highest score possible by destroying enemy crafts and getting combo bonuses through quick kill streaks. The game will also feature a final "Vader's Revenger" stage.